Liverpool produced a courageous second-half comeback to secure another vital victory against Burnley at Turf Moor to stay in touch with Man City at the top of the Premier League table. After a slow first half, the second 45 proved more entertaining – but it took goals from James Milner and Roberto Firmino to turn things around after Jack Cork had put the home side ahead. 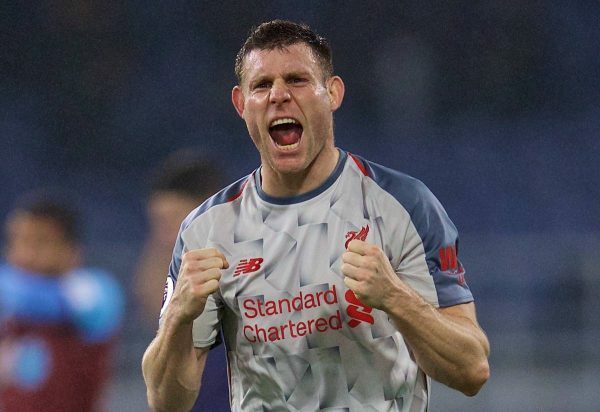 Milner put a well-placed shot past Joe Hart from the edge of the box, while Firmino finished from close range after a free-kick routine saw Virgil van Dijk guide the ball across for him. The Reds then put the icing on the cake with a superb counter attack goal finished off by Xherdan Shaqiri in stoppage time. It means that Liverpool now have the most points after 15 games of a season in the entire history of the club. Remarkable. “Any lineup containing Moreno instantly fills me with doubt.” – Chris-Anstey on Facebook. ”I trust the manager but that seems like an awful lot of changes.” – Thomas Landstrom on Facebook. Pretty risky #LFC lineup tonight. Good to see Rafa Camacho on the bench, but seven changes and so many big names out could be a big gamble. “I really like this lineup. I am looking forward to Keita linking up well with Sturridge, just like preseason. Nice and attacking. ” – nobluff on the forums. “Absolutely HUGE result that! Especially given the changes! Chuffed to bits! ” – Nic Rogers on Facebook. Simply a remarkable show of character from #LFC. It looked like a long way back from 1-0 in these conditions against a physical Burnley side but they just refused to let it go. An opportunity to go top at Bournemouth awaits. “Brilliant, fabulous win. The hallmark of champions yet again is winning when you start weak, start slow or play beneath your par. We did all 3 and still roared home.” – ptt on the forums. “Keita’s best performance of the season, no doubt.” – —- on Facebook. Naby Keita was excellent tonight for #LFC. Really good display from him. Ahead of a crucial period, it was vital for him to get some game time and impress. Naby Keita really showed what he’s about. Not easy to do it at Burnley either. Got kicked a few times but was brilliant driving forward and not sure he gave the ball away all night. So unlucky to not get a goal or two. ” – Red Ted on the forums. Unbelievable what Alisson has just done, unbelievable. This is easily worth 2 points in a precious league race. Liverpool's best player this season alongside Van Dijk, in my humble opinion. That save, gather and throw by Alisson. Top drawer. There’s nobody in the Premier League better than Alisson. Nobody. “That last save by Alisson was spectacular, that ball was going in top corner. ” – Neukolln on the forums. Burnley are throwing themselves into some ridiculous tackles. “Burnley were thugs tonight and despite that we were by far the best side. ” – Caradoc on the forums. – Derek Bryan on Facebook. Liverpool are now eight points ahead of Chelsea. Liverpool’s best start to a season ever, right? What a turnaround. Really poor in the first half but completely changed after Cork's goal. Alisson, Van Dijk and Keita all brilliant; that's what ~£200m should get you. ? Huge result to get three points there after making 7 changes and then going 1-0 down. Team showed loads of courage in the 2nd half, held their nerve so impressively. Klopp was spot on with the subs too. Let us know your thoughts on the game in the comments section.